People either love or hate the Arlington Street Bridge, which is nothing new. Controversy has dogged the span since its planning stages. Nonetheless, it has remained an icon of Winnipeg's skyline for a century, outlasting all but two other bridges and has seen incarnations of its nearest neighbour the Salter Street / Slaw Rebchuck Bridge. This is a four part series on the history of Winnipeg's Arlington Street Bridge commemorating the centenary of her opening on February 5, 1912. Part 4: So, What About That 'Nile Thing' ? 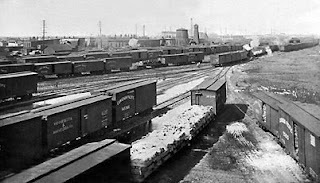 At the turn of the century there were limited options for crossing the CPR tracks: the subway at Main and Higgins; a rickety, old Salter Street Bridge and a street-level crossing way out on McPhillips Road. As the population and commerce of the region continued to grow, new solutions were needed. 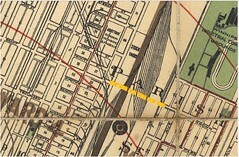 The idea of an overpass at Brown Street (in the North End) and Brant Street (in the south) was proposed in 1906. Despite the need for more crossings, the Brown and Brant Street Bridge was controversial. Some felt that replacing the existing Salter Street bridge with something stronger and larger was the best option. Others felt that this location was too far 'off the beaten track' to give much bang for what would be a huge infrastructure buck. The strongest argument in favour of the new bridge was that it would be just the second streetcar link to the North End, aside from Main Street. The Salter Street bridge was too old and frail to be retrofitted for streetcar service and, besides, the eventual redevelopment of that span would require another link to be in place to save a traffic nightmare on Main Street. The man who pushed the bridge project through from start to finish was Alderman Archibald A. McArthur. McArthur was born and raised in Ontario. He was a farmer and award winning cattle breeder, taking numerous top Dominion and North American honours for his stock. 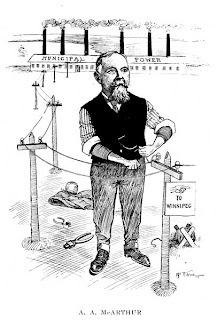 In 1881 he came to Manitoba to "spy out the land", (the term used in his obituary), and the following year moved his family out and started a grocery store in Winnipeg. The land was calling him, though, and from 1888 to 1891 went to farm near Gull Lake Saskatchewan. Upon his return to Winnipeg he resumed his grocery business with McArthur Grocery at 728 Logan Avenue (at Lulu), living next door at number 724, (both buildings have since been demolished). 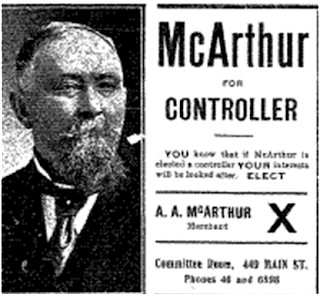 In 1904 McArthur took his first run at city council but lost. He was elected the following year and served for three one-year terms. By 1906 he was chair of the city council's bridge committee and the man tasked with negotiating road and land improvements between the city and the C.P.R.. 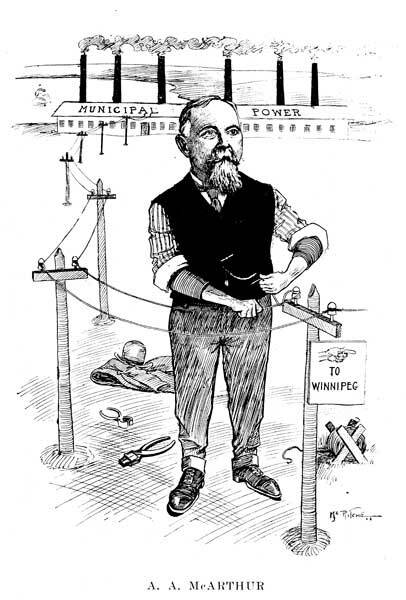 In 1906 the Brown and Brant Street bridge project was debated by his committee, made it through the council vote and became part of the official City of Winnipeg / C.P.R. improvements negotiations for the following year. The C.P.R. dragged its heels in the negotiations, opting in the end to let the Railway Commission in Ottawa rule as to whether or not it had to cost share the Brown and Brant Street Bridge. The reply came in November 1907: the C.P.R. had no financial responsibility. (Nov 26, 1907, Manitoba Free Press). Even without a cost-sharing partner, McArthur ensured that the project moved ahead. He had a vision that Arlington Street could be another Main Street stretching from south of the Assiniboine to the city limits in the north. A $600,000 money by-law was drawn up for a vote in the December 1907 municipal election. Included in that figure were expansions of the Main Street and Louise bridges as well as $240,000 for a new Brown and Brant Street Bridge. Ratepayers were not in a spending mood. Aside from school construction, no infrastructure bylaws had been approved since the end of 1905. This time would be no different. On December 10, 1907 the bridge bylaw was defeated (1484 for and 1585 against). The city tried again in the December 1908 election with similar results. In that 1908 election McArthur gave up his council seat and ran for a seat on the city's board of control and won, (the board of control was a sort of finance committee for the city under city council). In his new position as controller he could keep an eye on the project and make sure that it did not die. June 24, 1909. Manitoba Free Press. The need for improvements to the city's bridges was becoming dire and on June 24, 1909 the same $600,000 bridge bylaw was put back before the voters along with a series of other money bylaws. The Free Press, which had always been a proponent of the Brown and Brant Bridge, wrote in an editorial on the day of the vote: "Another improvement needed by a very large body of the city's population is a bridge over the Canadian Pacific Railway tracks farther west than the present overhead bridge at Salter Street". (June 24, 1909, Manitoba Free Press). This time the bylaw won. The Free Press speculated the following week that the new bridge was still going to face a stiff fight on council if it was going to see the light of day. Controller McArthur Is likely to have trouble of his own In bringing about the speedy materialization of this overhead bridge project for there Is a strong element In the council, which, while acquiescing to the mandate of the ratepayers as expressed by the recent vote sees no need for haste in expending the $232,000 required to erect the structure. July 8, 1909, Manitoba Free Press. Aldermen Gowler and Willoughby were the main detractors of the project, continuing to argue that this bridge was not the best option. 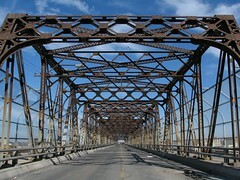 A colleague of McArthur's, Controller Harvey, publicly stated that the other improvements voted for in the money bylaws should be given precedence and added sarcastically "...but if Controller McArthur thinks that sidewalks, roads and sewers should be laid over to give this bridge preference he is entitled to think so." (January 27, 1910, Manitoba Free Press). Plan for the extension of Brown Street. (City of Winnipeg Archives). Despite the previous bylaw defeats it turns out that MacArthur had been doing his homework on the bridge project. Shortly after the winning vote he was able to produce plans for the bridge that had already been submitted and approved by the Railway Commission in Ottawa. Within a month the bylaw to expropriate the necessary land to bring Brown Street up to the edge of the tracks was tabled and passed at council. The Brown and Brant Street Bridge was going full steam ahead. Thank you. Not only was your article informative, but it brought my Great Great Grandfather Archibald A McArthur to life for me. You quoted his obituary. I have been searching for a copy for a long time. If you have any suggestions as to where I might look I would again be grateful. Oh wow, great to hear from you ! The bridge really should have been named for him ! When I get home I will send you the obit(s) and any other personal articles I found about him from the Tribune and Free Press archives. If you want to send me an email address that I can reply to at cassidy at mts.net. Was Arlington Street named after the bridge? Who was "Arlington"? Arlington was the name of the street from the Assiniboine River to Notre Dame. When the full stretch of road, including Brown and Brant Streets to the north, were renamed a single "Arlington Street", the Brown and Brant Street Bridge took the new name. Nice blog Post... Valuable info. Thanks for sharing..
We delivers a high quality of experienced knowledge to take on any size of project. With the best quality of work we provide full Bonding and liability insurance on all jobs.